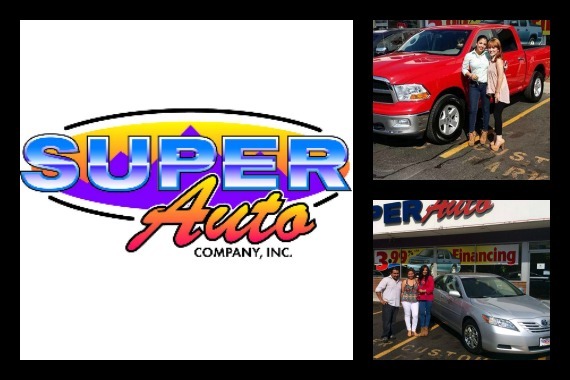 At Super Auto Company, we pride ourselves on fair prices, superior service, and treating our customers right with honesty and integrity! "We’ll be your helping hand." "April showers mean new windshield wipers! The rainy season is here, and it’s time to make sure your wipers are up to the task." "We don’t just care about cars here -- we care about the owners too!" "Have foggy headlights? You can use toothpaste and an old rag or toothbrush to clear the dinge and restore them." Great dealership! Found the dream of my car! Amazing customer service all friendly and happy to help! Would recommend to anyone! They find a way to help you no matter the situation! I buy a car from Super Auto Company! Excellent service I recommend you check with super auto for a best friend deal!!!!!! Coming into the dealership there was absolutely no pressure, worked with what we had, gave great advice. Would definitely recommend Super Auto! Yes, I'd like to receive news from Super Auto Co.
Sign up for the Super Auto Co Newsletter!